1. Antibacterial Hand Soap: Hey, remember the days when you could buy just plain. old. soap? And then all of a sudden, the FDA decides triclosan (the active ingredient in many hand sanitizers and antibacterial hand soaps) is A-OK, and overnight, everything has triclosan in it. Here’s where it gets tricky (tricky…triclosan…get it? Ha!). Triclosan has been banned in the E.U. (those smart people across the pond) since 2006. It’s considered a potent hormone disruptor that can cause infertility, early puberty, and other hormone problems in humans (Huffington Post). This “newsflash” hit the FDA in 2013, a mere SEVEN YEARS after it had been banned in the E.U. 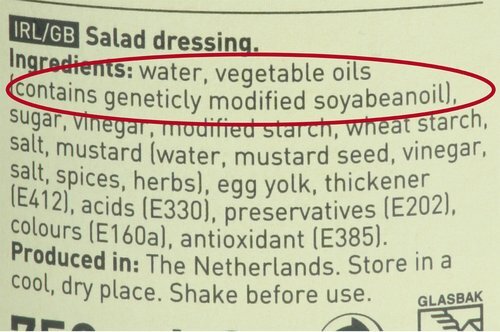 Just an example, but lists GMO soybean oil! Ever seen something like that over here? Want more info? Read this article. The point is, I don’t believe much of anything they say anymore. I’m sticking with things that HAVEN’T given humans giant tumors for centuries…like castile soap, coconut oil, and other things derived from purely natural sources. This has not been without some fairly humorous disasters. Homemade shampoo for my luxurious, long locks? Absolute utter failure. I managed somehow to look greasy and dry at the same time, and reek of apple cider vinegar. My patient and loving boyfriend held his breath for two weeks as I stubbornly resisted returning to store-bought shampoo. Who remembers the Oil-Cleansing Method disaster? I decided to cleanse my face with a mixture of oils and steam. And I received for my troubles the worst cystic acne outbreak OF MY LIFE. Like, seriously, people were assuming I was a teenager. I still have scars. Both emotional and physical. And the next post will be all about homemade deodorant that really works, what I settled on to break my dependence on ProActiv skin care, and best and most successful of all, homemade super simple bar soap that is very popular amongst my family and friends. So simple. So effective. Good for all fabrics because its gentle!! My boyfriend has extremely sensitive skin. He loves this stuff. I washed silk in it the other day, and no ill effects at all. I even wash my work uniforms in it (hot/hot), and it gets the stink out. Major win! Essential oils that make you happy. I love lavender best of all. You shake it up. Dump it in the machine (recommended about a 1/4 cup per load. I use less than this because I have a high-efficiency machine). BAM. This one is so simple, I almost feel bad for posting it. Thanks for sharing your recipes. I think the homemade laundry detergent would be a big hit with my hubby. It’s a really great recipe! You can also tweak it depending on your laundry needs. With silk and other delicate fabrics, I use a white vinegar rinse.